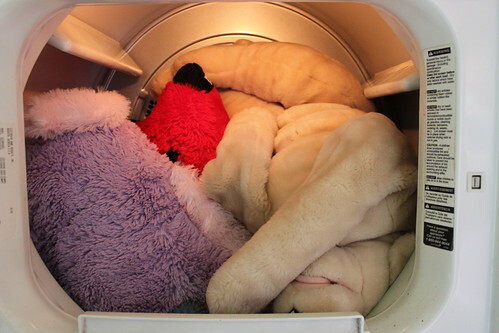 Our dryer is working overtime. And guess who got it? I noticed at dinner the other night that Anya had nits. After attacking her like a monkey mama, I discovered an actual louse. Inspecting Lily turned up more of the little buggars. This was Saturday night. Since then, we've done about 100 loads of laundry, tumbled in a hot dryer EVERYTHING, cut a combined ten inches of hair of the girls (six off Anya and four off Lily), treated with Quit Nits, combed and combed and combed some more and canceled plans with friends. 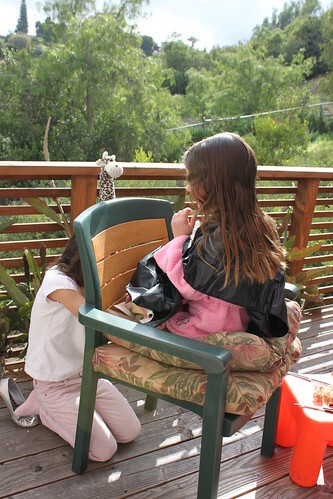 Lily performing a puppet show for her sister while I cut Anya's hair. The Mister & I are currently hanging out with shower caps and Quit Nits on our heads. I found a single louse on him, but no signs of eggs or nits at all on either of us. We figured treating our own heads made sense anyway as well as all our bedding. Honestly, we should feel lucky. When you have school children, especially girls, it seems to be a question of when you'll find those dastardly buggars on your children, not if. Here's hoping all these measures will work quickly. 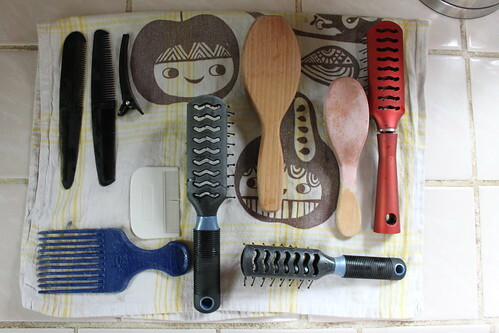 Boiling brushes and combs... didn't go so well for the wooden ones. If you've been here, tell me what worked for you. I'm open to all suggestions!